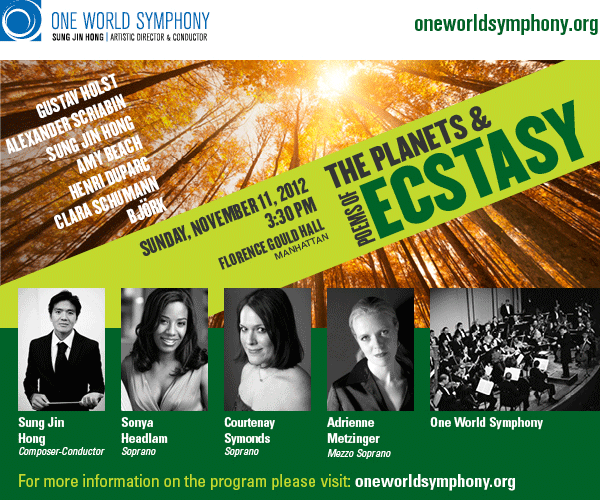 One World Symphony Makes Music for Humanity. As I sat in the Starbucks on the corner of Broadway and 60th Street at Columbus Circle and was writing this review, I looked out into the milieu of people running around on an autumn New York evening. I was comforted by what was confirmed through the concert by One World Symphony I had just heard. I felt sure in my conviction that no matter what skin color, what faith or what culture you might claim, music can serve to bring people together and to promote harmony amongst us all. One never really knows just what to expect at a One World Symphony concert. There may be Can-Can dancers, blood-covered divas, or a world premiere of a new piece of contemporary music. When I was invited to a One World concert last Sunday, November 11 at the French Institute Alliance Française; I knew it would be anything but business as usual. The concert, entitled The Planets and Poems of Ecstasy, was sponsored by the Ramakrishna-Vivekananda Center of New York for the commemoration of the 150th birthday of the great spiritual leader and Indian Hindu monk, Swami Vivekananda. The mission of the Ramakrishna-Vivekananda Center, and subsequently the mission of this concert as well, was to promote “the spiritual unity of humankind and the harmony of all religions.” — For any artist, or group of artists, this is tall order to fill. Before the lights ever dimmed, I knew that this performance would test the mettle of the musicians and the maestro. How exactly do you (effectively) promote spiritual unity of humankind and all religions while simultaneously honoring an epic religious figure? Repertoire is a good place to start, and Maestro Sung Jin Hong did an excellent job of selecting works that both provided immediate and visceral emotions, alongside more temporal gestures. The featuring of Gustav Holst’s Planets connected the music of the orchestra to the Hindu culture through Holst’s own interests in Sanskrit and Hindu texts. But, have no fear, the connection wasn’t purely academic, Maestro Hong literally invited the audience to stand and sing along with the orchestra to the melody from the movement of Jupiter, the Bringer of Jollity. Many did not know the words, many sang only on la’s or da’s, but the effect was fully realized. In an instant, a packed concert hall stood together and sang with one voice on one melody. Is this not essentially a metaphor for universal unity for all mankind? Soloist Courtenay Symonds presented an intriguing acoustic performance of Bjork’s Big Time Sensuality andMezzo-soprano Adrienne Metzinger beautifully sang an arrangement of Clara Schumann’s Liebst du um Schönheit. But of all the soloists in the vocal medley, soprano Sonya Headlam entranced the audience. Through beautiful phrasing and a heartfelt authenticity, she was able to transcend the simple lyrics of Amy Beach’s Ecstasy and present us with music made in the heart. The concert also included the world premiere of Maestro Sung Jin Hong’s composition, The Architect. It was an enigmatic piece, reminiscent of Bernard Herrmann’s great works for the screen. I was especially reminded of Herrmann by the epic figures and main motives played by the horn section. The Architect definitely took the audience on a complex emotional, and perhaps, spiritual journey as the piece was received with a standing ovation. The great centerpiece of the concert was Ravel’s Daphnis et Chloé, Suite No. 2. The wind section was a tour de force in every sense of the term and played with bright bursts of light and with broad strokes of color. Perhaps the best thing about One World Symphony is that while other orchestras may always begin with good intentions to relate to their audiences, One World Symphony always makes good on its promise. Through innovative concert programming, to in-concert discussions about what makes the music relate to the concert’s theme, to the intimate spaces in which the orchestra typically performs—make no mistake, One World Symphony is one of New York City’s most liquid, adaptive, and creative orchestras. One thing I can relate to…as Sung Jin Hong said about The Architect – we are always constantly searching deep inside ourselves as we move forward. This was an amazing concert!!! I loved the participation of the audience. I can’t wait to listen to the next season.